Significant regions of the electromagnetic spectrum, with their approximate wavelengths. 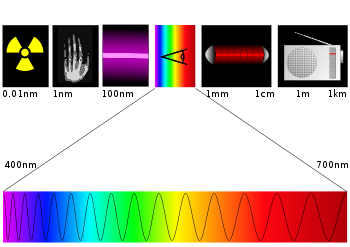 The bottom part of the illustration shows an expanded version of the visible spectrum. Photochemistry, a sub-discipline of chemistry, is the study of the interactions between atoms, molecules, and light (or electromagnetic radiation). The chemical reactions that take place through these interactions are known as photochemical reactions. Examples of photochemical reactions are photosynthesis in plant cells and light-induced changes that take place in the eye. In addition, photochemical reactions are important in photography, dye bleaching, and television displays. A photochemical reaction may be thought of as a reaction ignited by the absorption of light. Normally, a reaction (not just a photochemical reaction) occurs when the molecules involved gain the activation energy necessary to undergo change. For example, for the combustion of gasoline (a hydrocarbon) to produce carbon dioxide and water, activation energy is supplied in the form of heat or a spark. In the case of photochemical reactions, light provides the activation energy. The absorption of light by a reactant elevates the reactant to a higher energy state, or excited state, and the process is called "photoexcitation." The absorption of a photon of light by a reactant molecule may permit a reaction to occur not just by bringing the molecule to the necessary activation energy, but also by changing the symmetry of the molecule's electronic configuration, enabling an otherwise inaccessible reaction path. A substance that absorbs radiation and transfers energy to the reactant is called a "photosensitizer." When a photoexcited state is deactivated by a chemical reagent, the process is called "quenching." The first law of photochemistry, known as the Grotthuss-Draper law (for chemists Theodor Grotthuss and John W. Draper), states that light must be absorbed by a chemical substance in order for a photochemical reaction to take place. The second law of photochemistry, the Stark-Einstein law, states that for each photon of light absorbed by a chemical system, only one molecule is activated for a photochemical reaction. This is also known as the photoequivalence law and was derived by Albert Einstein at the time when the quantum (photon) theory of light was being developed. Like most scientific disciplines, photochemistry utilizes the SI, or metric, measurement system. Important units and constants that show up regularly include the meter (and variants such as centimeter, millimeter, micrometer, and nanometer), seconds, hertz, joules, moles, the gas constant R, and the Boltzmann constant. These units and constants are also integral to the field of physical chemistry. ↑ International Union of Pure and Applied Chemistry. "photochemistry". Compendium of Chemical Terminology Internet edition. Retrieved August 21, 2007. Photochemistry. The Chemogenesis Web Book.